On his one hundredth birthday, feeling reluctant to go to his party in which the Mayor and the media will be in attendance, Allan climbs out his window and disappears. He heads to the bus station, steals a suitcase, borders a bus, befriends a petty thief, an eternal student and his beautiful fiancé, and her pets: Sonya the elephant and an Alsatian dog. He also is on the run from police and a gang of criminals. His life has taken quite a turn. In fact, his life has taken many turns. Over the course of the novel it is revealed that Allan was good friends with US President Truman after sharing two bottles of Tequila with him, that he used his explosives expertise to support US war efforts, the Chinese anti-communists, and later Stalin (it’s worth mentioning that Allan holds no political views whatsoever). He hitchhikes with Winston Churchill, travels on a riverboat with the wife of Mao Zedong and walks across the Himalayas on foot. He hangs out with Amanda Einstein (related to that Einstein), who is a corrupt Indonesian politician with ‘a lot of dollars’. Allan is quite a cute character, innocent, like Forrest Gump, he has a hyperbolic influence on the world and a penchant for vodka. Meanwhile,the author, Jonas Jonasson adopts a very distinct and quirky narrative style. Think Lemony Snickett’s Series of Unfortunate Events, or even Mark Haddon’s The Curious Incident of the Dog in the Nighttime. Sonya was not about to do circus tricks for just anybody, but she happened to like this old man. He gave her fruit, scratched her trunk, and chattered with her in a friendly way… So when the old man asked Sonya to sit down, she sat down… The fact that she got an apple or two for her trouble and an extra bit of scratching on her trunk was a pure bonus. Sonya could not be bought. Allen and Unwin has kindly offered lip readers a chance to win one of three copies of The 100 Year Old Man Who Climbed Out the Window and Disappeared. All you have to do is email books@lipmag.com with your name and address with the craziest story your grandparents have told you, or the craziest thing your grandparents have done. The best three will be rewarded with a copy of the book. Get your entries in by October 5. The 100 Year Old Man Who Climbed Out the Window and Disappeared is published by Allen and Unwin. From this review it is clear you have not actually read the book! Poor review, get your facts right next time! Some things in this review are actually not happening in the book….did the person who wrote the review actually read the book??? What things are you referring to? For instance, Amanda Einstein is only related to “that” Einstein by her marriage to Herbert Einstein, and she didn’t marry Allan. Amanda also had “a lot of dollars” because of Allan, not on her own. Must have gotten the information from wikipedia, which also repeats much of the same incorrect summary. It is, however a GREAT read. I love reading fiction with as much real history packed into a plot that makes it engaging and relatable. Besides a fast moving, FUN plot, the books briefly delves into the history of the atomic bomb, famous personalities, the causes leading up to major conflicts of the last century, and quirky summaries of major philosophies … all covered humorously, and so, memorably! 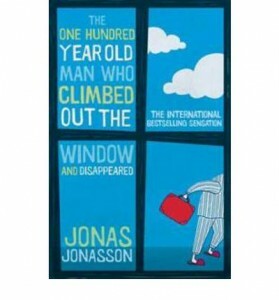 This entry was posted in Books, Featured and tagged book review, books, crime, giveaway, Jonas Jonasson, lip lit, literature, novel, quirky, Review, Scandanavian, Swedish, The 100 Year Old Man Who Climbed Out the Window and Disappeared. Bookmark the permalink.